Besides simply being happily busier lately, there’s been a new kid on the social media block that’s peeked my interest and taken away a portion of my posting time. 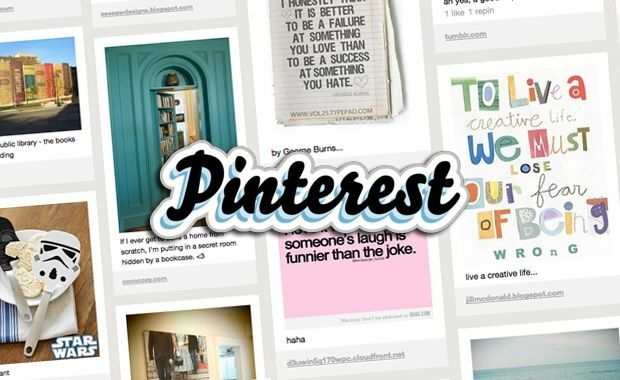 By now, you’ve undoubtedly heard about and/or dabbled in the #3 most popular social network (beaten only by Facebook and Twitter) – Pinterest. This rank is according to the latest report by Experian Marketing Services, and was acheived in a very short amount of time. 1. I have the following educational boards on which I collect lesson plans, videos, articles, and images to use in and out of the classroom. c. Literacy Coaching: a collection of tools to share with faculty as we spread best practices in literacy instruction that aligns with our common core standards. Note: I just started this board and look forward to continuing to add to it throughout the sumer as we “facelift” our current literacy coach program. I am the coordinator of the literacy coach program at my school and truly enjoy getting out of my classroom and visiting/observing classes in other subject areas. Watch for future pins that will reflect ALL content areas. d. Writing Well: Here is where I pin resources for my own writing as well as lesson plan ideas for my own students. Loads of writing prompts here! e. Greatly Good Grammar: Need to brush up on your grammar? I’m pinning quick and painless grammar tips here. f. Speak the Speech: Collection of speeches, body language tips, interpersonal studies . . . As speech class is an entirely different curriculum all its own, I foresee this board growing into 3 – 4 boards. Stay tuned!! h. Shakespeare: Board devoted to the Bard . . . links to sites, pictures and quick facts about him and his works. i. Education: Items that can be useful to any educator – everything from appreciation gift ideas to school supplies to graphic organizers. j. Teacher Technology: I will be referring back to this board quite often this summer as I prepare to flip my classrooms as much as I can. I’m adding to this one every day, so stay tuned!! k. Carefully Counseling Careers: As I contemplate pursuing my PhD in Counseling, a collection of resources for college and career. One of the reasons I enjoy teaching Senior Expository Composition so much is because I revel in our college preparation unit. After assisting my daughter through her own very successful college admissions journey, I feel experienced and passionate about this step everyone should be privileged to take in life. 2. I have a collection of boards on which I collect artifacts to aid me in my hobbies, personal goals and every day life. b. Nutrition Nuggets: The power of food fascinates me. The more I learn about food, the more reality sets in that we truly are what we eat. Here is where I will be collecting facts and figures about nutrition. This is also a fairly new board so plan on its immense growth!! c. My Visual Bucket List: Honestly, when I signed on to Pinterest, this board was why. I planned on pinning my bucket list desires and that’s about it. Well, that certainly flew out the window quicker than a suffocating fly!! d. Yoga Love: I LOVE yoga. A dear friend introduced it to me a few years back, and I’ve been stretching my way happy ever since. My only wish is that I had more time for it. I make time once a week for Hot Yoga – but my body craves more. e. Quotable Quotations: True followers of GG will remember I already have a category devoted to quotations on this site, Quotable Quotations. I wouldn’t be a true English teacher if I didn’t love the written and spoken word. This is the one board that gets the most repins. I simply pin those words that I’m feeling at the moment. Once, when having a difficult moment, I pinned a quotation that was exactly what I was feeling at the moment – I woke up the next morning to 1500 repins!! Apparently, many could relate to what I was going through!! Power of the pin!! g. Books Worth the Read: when I’m not at school, I’m working out. When I’m not working out, I’m reading (after a few pinning moments, of course!). Here is a collection of my favorite books along with a few I plan on reading this summer, poolside of course. i. Food to Taste and For Fun Food: Of course, I have to have the healthful and the not-so-much foods. It’s all about eating right so one can afford to cheat once in a blue moon. Pinterest is a FABULOUS place to hold recipes!! j. Particularly Pleasing Products and Ideal Ideas and Goods Good to Know . . . all boards that provide a convenient place for me to store products I wish to make note of/buy in the future, ideas I may wish to try, and life lessons good to know. And the list goes on . . . check out my Pinterest page for all 47 of my boards. There you have it – my take on one of the most popular social networks currently available. Pinterest truly is a place to quickly hold and organize pieces of information that you wish to hold on to. There are seemingly endless possibilities: plan a special occasion, plan a lesson, collect for a portfolio, have students pin character boards, etc. While I don’t see my zealous for Pinterest winding down any time soon, I will be making a concerted effort to divide my online time between pinning and posting. 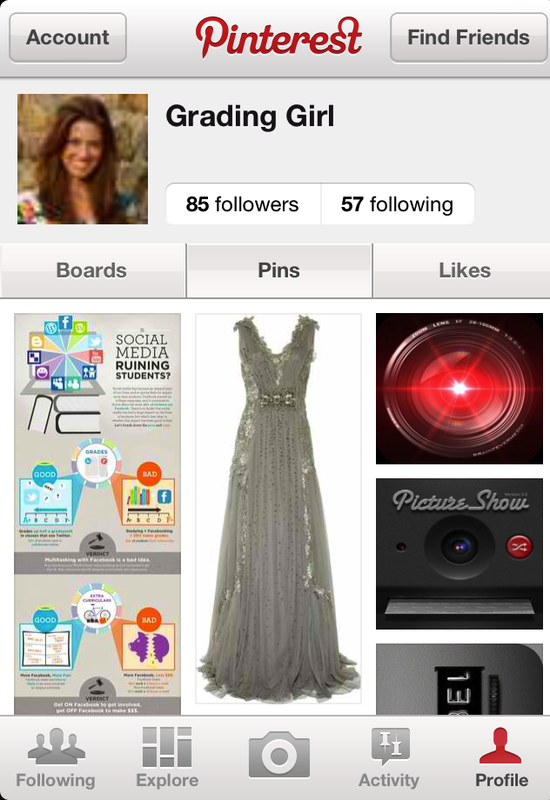 In the meantime, join me on Pinterest @ www.pinterest/gradinggirl. I look forward to your pins!!! By the way, if you are currently on Pinterest, please feel free to click the little “Pin It” you see at the top or bottom of this page. That will get this post on Pinterest – another great way to share information!! Thank you!! !